Gustavo Dudamel’s premature departure in consequence of having aggravated an injury short-circuited his planned South American night at Symphony. BSO Associate Conductor Ken-David Masur stepped in Thursday night with Berlioz replacing Desenne’s Hypnosis Mariposa. Pianist Sergio Tiempo substituted Ravel for Ginastera. Soloists Machado and Castillo, along with the Tanglewood Festival Chorus, appeared in the only originally programmed work, Antonio Estévez’s emblematic Cantata Criolla—a scorcher. The contours of this concert began shaping up with Berlioz. He threw himself out of the window of a laboratory to escape dissecting rats, flung himself into the Mediterranean only to be rescued, and disguised in woman’s dress, he failed an attempted murder. Such eccentricity, as Berlioz describes in his autobiography, cloaked my listening to the Roman Carnival Overture. Such “obsessive enthusiasm,” though, mostly gave way to tightness. Quasi-maniacal stirrings eventually shot through in the final minutes. Up to that point, the tactic of lean and long-limbed Ken-David Masur superseded older models by way of sprawling arms in rehearsed athleticism supplanting wanted poetic imagination á la Berlioz. With its Spanish inklings, Maurice Ravel’s Piano Concerto in G Major linked with the cancelled Ginastera, if maintaining only a flicker of that Argentinian’s flair. Born in Caracas, pianist Sergio Tiempo has often performed with Dudamel, but even without the famed conductor of Venezuelan youth orchestras, the well-regarded pianist ably turned the Frenchman’s guitarra-like phrases. 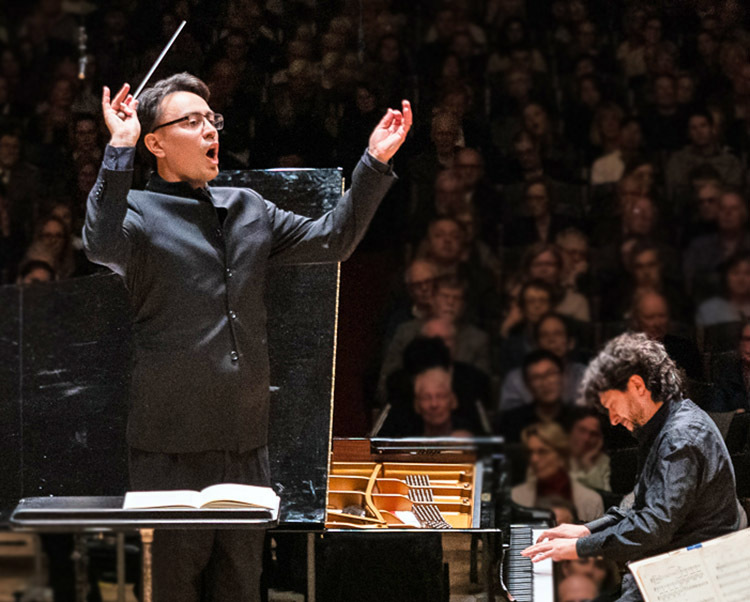 Even in Dudamel’s absence and a re-contoured concert, when Tiempo sat at the Steinway thoughts of their native Venezuela and the travesty of humanity there could not be banished. Having been mentored by esteemed Martha Argerich, the Venezuelan offered vigorously robust interpretive playing of the Ravel. Tenderness of remarkable delicacy and immediacy he adeptly called up as savorable “moments.” Here and there the Allegramente thrilled. The least compelling of the three movements, the middle Adagio assai, suffered somewhat from an infusion of the pianist’s own ways. The temperature of the extended unaccompanied opening could be likened more to New England climes. Emotive swings overwhelmed the uniquely long melodic wending of Ravel. Tiempo marginalized the meditative, floating interplay of a slow waltz of the left hand with a still slower three beat of the right hand. 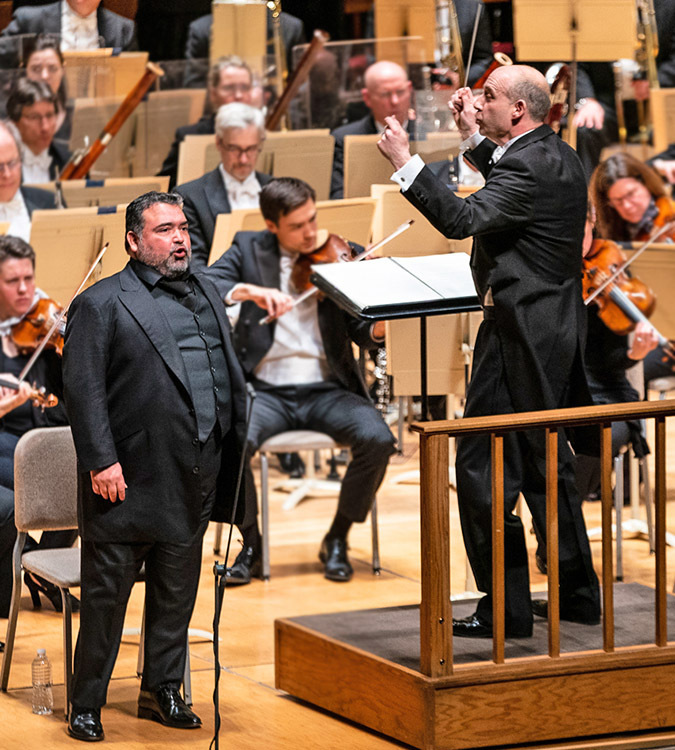 Off and rollicking and surely on a “glide path,” the third and final movement marked Presto from Tiempo and the BSO impressed. It was a time to revel in superb Ravelian artistry. Ravel’s handsome writing for the English Horn met its equal in Robert Sheena’s brilliantly hued playing. The less-than-full hall recalled Tiempo over and again until he relented with Ginastera’s Danza del gaucho matrero (“Dance of the Outlaw Cowboy”) from 3 Argentinian Dances, Op. 2. This wild and wooly encore prompted caricatures of a pianist with flying hair and piano strings popping. Perfectly paired, Venezuelans tenor Aquiles Machado and baritone Gustavo Castillo complemented each other with light and dark sides respectively. These two fully captivating voices ignited fiery feelings. The chorus’s sensuously charged rhythmic chanting reechoed after the final blistering climax. On the podium, Tanglewood Festival Chorus’s James Burton fired up the orchestra in song and dance flavors from the Llanos (a treeless grassy plain). Cantata Criolla could have been repeated as an encore!